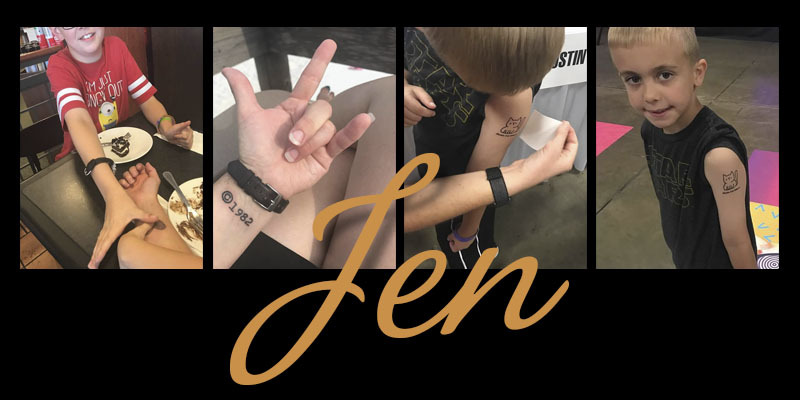 Our newest official member of the Tattooed Moms Club is Jen S. She’s a single momma to two boys that’s living her best life and making great memories for them to look back on. I’m so glad to have her as part of the club! I grew up as an army brat so all over but, spent most of my childhood in Fayetteville, North Carolina. I currently live in San Antonio, Texas. I have two boys, ages 11 and 6. The oldest is intelligent and brainy and the youngest is full of energy! I’m a single momma. So, the parenting style is co-parenting. We work hard and play hard. I try to do something fun with them each week I have them. We go to museums, amusement parks, main event, the beach, baseball games, movies, etc. We play board games and card games. Patience and compromise. Everything changed when the divorce happened. Having the boys all the time to half the time and making sure parenting was still the same when they leave the house and once they come back. That is a huge lesson of patience and compromise. I have never face discrimination but my mom didn’t like the idea that I got tattoos lol. I explained to her that nowadays tattoos are more trendy and mainstream than in the past. I have three tattoos. One is of my boys thumb prints shaped into a heart. Second one is of the year I was born with a copyright symbol. The third one is an infinity sign with birds on the right and an elephant on the left. I have two sisters and those are their favorite animals. The next tattoo is my boys’ constellations around the heart. I have gotten my tattoos all this past summer, lol. So the age of 36. I guess you could say the mid life crisis hit, lol. My favorite hobby is photography and taking tons of pictures of my kids. I try to make sure I take a picture a day. I have done this for over a decade now. I love the Tiffany blue color but make it with my name instead. So Jen and joy because that color brings me joy! Thanks so much for sharing a bit of your story with us, Jen!! We’re happy to have you as part of the Moms Club!! All featured moms are part of the “Moms Club” and you can find all of their posts in the Moms Club category. Get to know the moms in the club – they’re all amazing!